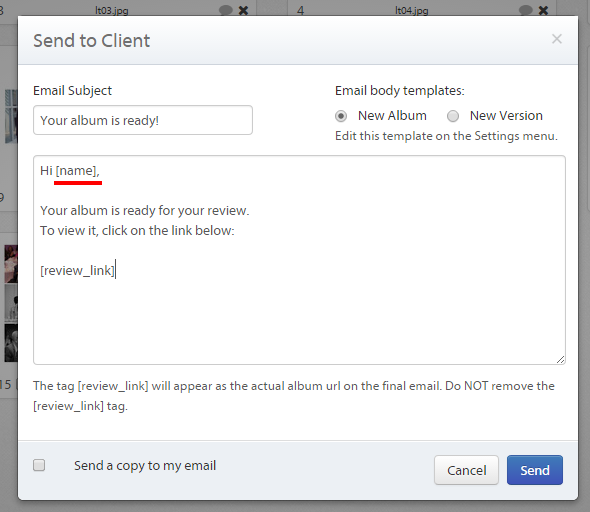 Do you know you can automatically insert the album name in the emails? Today, Albumdraft’s user Angela (from Red Meadow Design Co.) asked us if there was a way to automatically insert the album name/title in the emails sent to her clients. So, if you use your clients’ name to name your albums (ie. : John and Mary) that’s a good way to easily make every email personal. ← New Branding Tab and the Ability to Better Customize the Emails Sent to Your Clients.